A counter-intuitive result of Oliver Heaviside showed how telegraph cables should be designed [see this week’s That’s Maths column (TM066) or search for “thatsmaths” at irishtimes.com]. In Wicklow town an obelisk commemorates Robert Halpin, a Master Mariner born at the nearby Bridge Tavern. Halpin, one of the more important mariners of the nineteenth century, “helped to make the world a global village”, by connecting continents with submarine telegraph cables. Halpin left home aged just 11 and had many nautical adventures before taking command of the leviathan SS Great Eastern, a brainchild of Brunel. Its mission was to lay a telegraph cable across the Atlantic Ocean, from Valentia Island to Newfoundland, a distance of some 2600 miles. The consulting engineer was William Thomson, later Lord Kelvin, the outstanding Belfast-born scientist who oversaw the laying of the cables. Telegraph speed on the first cable, completed in 1858, was very slow, and it failed within a week. A second cable was more robust and faster, carrying messages at eight words a minute – about one Morse character per second. Thomson had analysed the transmission properties of cables and had argued that electrical resistance and leakage should be minimized for best results. As signals travel along a telegraph cable, they lose energy and also suffer distortion. Different components of a signal travel at different speeds, leading to corruption of the message. To ensure distortion-free transmission, components of different frequencies must travel at the same speed. Early cables were designed to reduce energy loss, with no effort to avoid distortion. Thomson had used an equation of parabolic type, with solutions that diffuse and dampen out but that are not wave-like. But he omitted a crucial factor: when a current flows through a wire it generates a magnetic field, which acts back on the current and inhibits the flow. This self-inductance has a major impact on the transmission characteristics of a telegraph cable. The self-educated and eccentric English electrical engineer Oliver Heaviside derived a mathematical equation – called the telegraph equation – which included inductance. This effect completely changes the nature of the solutions so that they have a wave-like character. Mathematicians call equations of this type hyperbolic equations. Heaviside’s idea was simple: a signal that has been damped can easily be amplified, but one that is distorted is difficult if not impossible to recover. So the design should focus on removing distortion. He showed that, to achieve distortion-free transmission, some electrical leakage between the conductors of a cable is essential. Heaviside found that two quantities, one involving resistance and one involving leakage, must have their arithmetic and geometric means equal. But we learn in school that this happens only if the quantities themselves are equal. This gave him a condition on the properties of the cable that are needed to avoid distortion of the signal. The upshot of Heaviside’s mathematical analysis was that cable designers should not try to reduce leakage but, rather, should increase the inductance to achieve the balance required for distortion-free transmission. Heaviside was a controversial character, in regular conflict with the scientific establishment, and the engineers responsible for cable construction were not inclined to listen to him. Cables are very expensive and manufacturers were reluctant to implement the new design. They either did not understand or did not believe his theory. 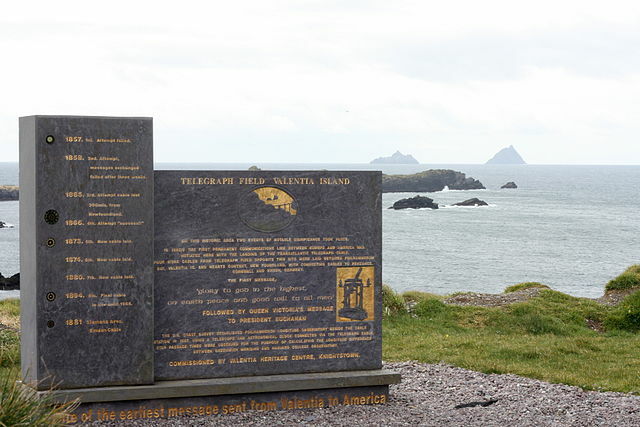 Memorial at Valentia Island to mark the laying of the transatlantic cable to Newfoundland. Made of Valentia slate and designed by local sculptor Alan Ryan Hall. Photograph: John Flanagan (Wikimedia Commons). As a result, it was several decades before Heaviside’s brilliant ideas were implemented. But from the beginning of the twentieth century, distortion-free telegraphy was widely implemented and became an industry standard. Transmission speeds could then exceed 100 words per minute. The telegraph equation is still found in modern textbooks on partial differential equations. It was first derived by Oliver Heaviside in 1887. He argued that long-distance telegraph cables should be designed so as to reduce distortion of the signal to a minimum. Previously, cable design was based on a theory developed by William Thomson. Thomson, later Lord Kelvin, ignored the so-called self-inductance effect, the magnetic field generated by a current, which acts back on the current itself. This theory led to a parabolic equation, treating telegraphy as a diffusive phenomenon rather than as a wave propagation. This condition corresponds to the requirement that the arithmetic and geometric means of RC and GL should be equal, which requires that the two quantities themselves are equal. For typical cables, RC is much larger than GL. Heaviside proposed the addition of induction coils to telegraph cables to increase their induction so that (1) would hold. This is remarkable: leakage is normally considered as undesirable and is minimised. But Heaviside argued that it should not be eliminated, but used to tune the quantity GL so that (1) is satisfied. Far from being the “bad guy”, leakage was a means of preserving the form of the signal, or transmitting it uncorrupted. It is said that the editor of the journal that published Heaviside’s work was fired, so unpopular were the new ideas with the cable-makers, who found Heaviside’s ideas counter-intuitive. Kirk T. McDonald, 2012: Distortionless Transmission Line. Joseph Henry Laboratories, Princeton University, Princeton, NJ 08544 (November 11, 1996; updated November 23, 2012). PDF. The Maritime Museum in Dun Laoghaire has a range of material on Robert Halpin.